They say the best relationships are those that start with friendship and laughter, and that is certainly true for Katie and Luke. When a mutual friend set them up on their first “group” date together, it was a bit suspicious when those friends had to bail because of a missing babysitter. But all was not lost, and Luke and Katie made it to a second date at a comedy club, where much of the laughter came at Luke’s expense – poor guy! Their love story didn’t end though, in fact that was really just the beginning of an adventure that has taken them to many cities, but always circles back to their friends and family, and laughter, and of course their mutual love of board games! Invitations: designed by the Bride! 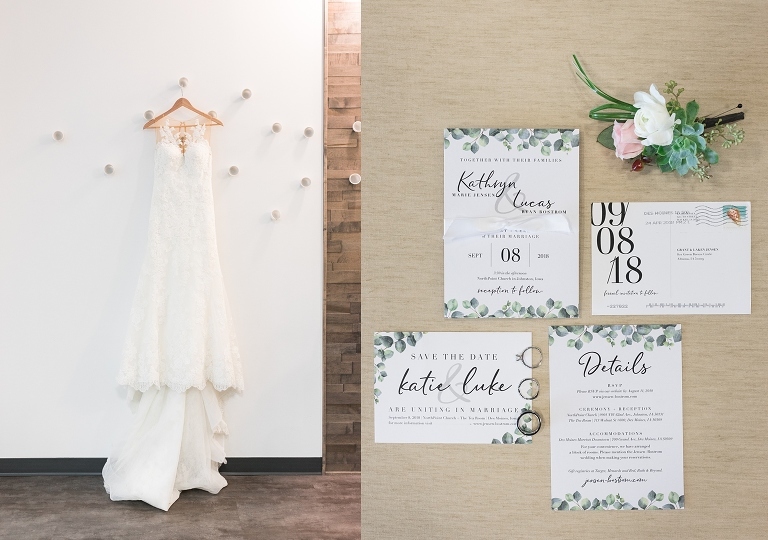 Their beautiful day started at Northpoint Church with beautiful wedding invitations designed by the bride herself, and this perfect Pronovias wedding gown. 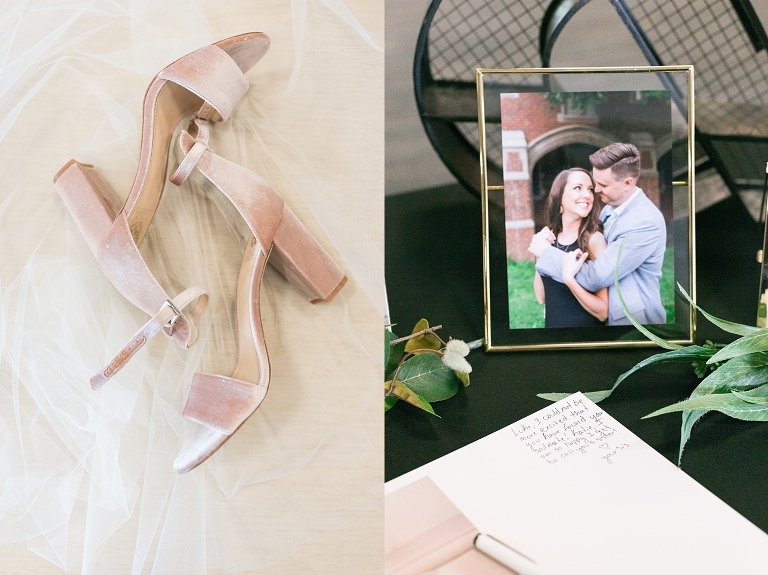 These wedding shoes were perfection – beautiful, the perfect shade of pink, and they were comfortable too! I have been having a lot more brides pick a stacked or chunkier heel like this, and it is so much more practical for a day where you are on your feet for a long time! Katie shared a sweet first look with her dad. And then this moment with Luke had us all choked up! Katie and Luke got married on the first beautiful sunny day after a LONG series of rainy, cloudy, gross days. It had been flooding all over Iowa, and so I was convinced there was no way we would have a spot for photos anywhere that weekend because it would be soaking wet or raining. Thankfully, it was GORGEOUS that day! 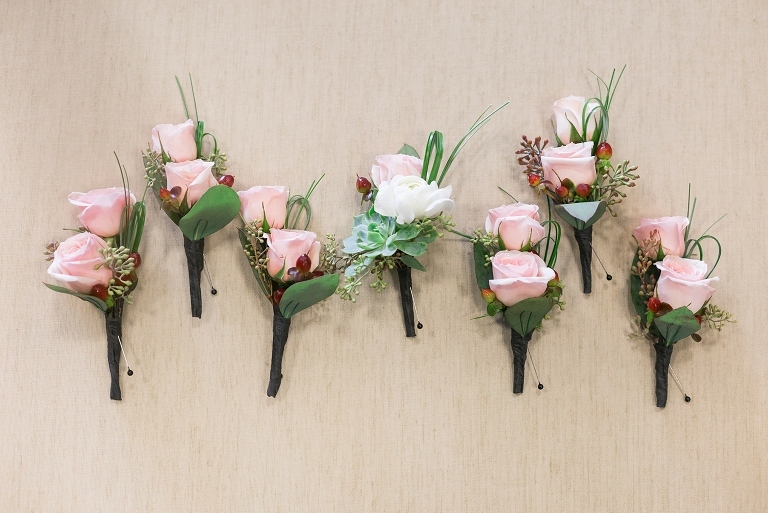 Plaza Floral & Gifts provided these stunning bouquets – loved the mixture of succulents and blush and Burgundy! I don’t often share formal portraits from weddings, but this sweet photo of Katie and her grandma just made me catch my breath – I hope this is a picture she treasures for many years. After making their way downtown to Des Moines, we stopped for a few more photos by the capitol. One thing I loved about this bridal party and all of their friends – they were COMMITTED to each photo we did! Just check out Luke’s face – he was ALL IN! When the Hawkeyes win the game! They were married on the same day as the Hawkeye vs Cyclone game – and if you’re not from Iowa or don’t care about college football, that is meaningless…but if you are a fan like they are, it is a BIG DEAL! They got to ride the Hawkeye Bus!!! Their reception was held at the renovated Des Moines Tea Room, which is one of my new favorite venues! So classy and perfect! I just wanted to photograph them on this balcony at the Tea Room all night! When your team wins the game on your wedding day, you sing the fight song, of course! 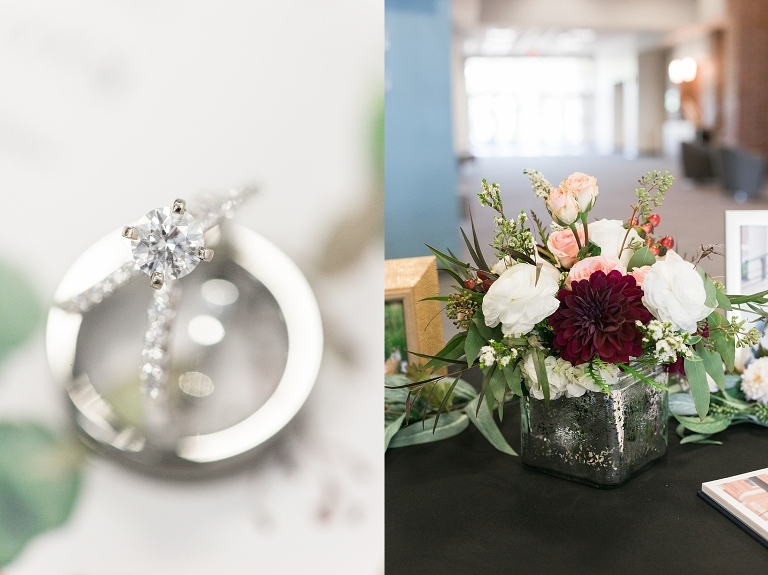 When Holly set up their first date, I’m not sure she had in mind giving them a toast a year and a half later, but it was a sweet word of affirmation and encouragement to the newlyweds. This moment – it was a small moment, and a quiet one right before toasts started, but I love it! Let’s dance! And dance they did! ASEDJ kept the dance floor packed! Congrats to the new Mr. and Mrs. Bostrom!